Cookies can be very dangerous. With the help of cookies people can easily steal your data. So it is better to remove the cookies every time. But deleting the cookies from many browsers is very difficult. 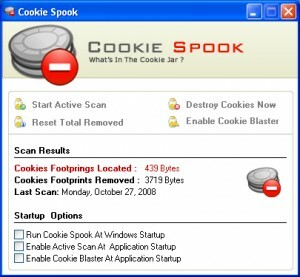 In these situations you can use Cookie Spook to delete all the cookies from may popular browsers. With Cookie Spook you can easily remove browsing cookies from your computer. With just a single mouse click you can remove all the cookies from your computer. Cookie Spook is compatible with the latest versions of Major Internet Browsers like Internet Explorer, Firefox, Opera and Google Chrome. The best thing about Cookie Spook is that it supports Real-Time scanning protection. So when a new cookie is detected on your computer it will alert you. So if you feel that the cookie is not needed you can remove it. Freeware, So you don’t pay anything.